Thoroughbred is a type of horse. They are mainly used for racing. Horses have been used for many years, for farm, racing to harness work. Horses were the fastest way for people to travel on land before cars were invented and the only way to travel long distances in a reasonable amount of time. Most horse breeds like this one have been bred for a specific reason; the thoroughbred race horse was bred to run. Thoroughbreds originate from the Arabian breed, and all thoroughbreds can be traced back to three original sires (fathers): The Byerley Turk, The Darley Arabian, and The Godolphin Arabian. Thoroughbreds are known around the world for their speed, but also for their jumping ability, which make them good for show jumping and other horse activities. Although thoroughbreds generally are slightly temperamental, they are very trainable and loyal. Thoroughbreds are generally tall and sleek, with long legs to help carry them along the race track. Thoroughbreds can be many colours, such as the following :bay (a colour which is brown with a black mane and tail), chestnut (red-brown), black and gray. The appearance of the Thoroughbred reveals its Arabian ancestry. It has a refined head, with widely spaced, intelligent eyes, a long, arched neck and prominent withers. The shoulder is extremely sloped. The heart girth is deep and relatively narrow. The croup is high and the quarters are substantial. The legs are clean and long with pronounced tendons. It has a long, low stride, giving it incomparable speed as a race horse. The Thoroughbred is predominately bay in color, but gray, black, brown and chestnut are also found. It stands between 15 and 17 hands. The Thoroughbreds best suited for sprinting have shorter backs, more substantial quarters and less height. The Thoroughbred's genetic origin is Arabian. The Arabian foundation stallions which were brought to Britain in the late 1600s and early 1700s were bred to domestic mares – very probably Scottish Galloways – although they may have been bred to Arabian mares, too. A substantial number of early Thoroughbreds were bred in the vale of Bedale in the County of Yorkshire in Northern England. The foundation stallions of the Thoroughbred breed and years in which they arrived in England were: the Byerly Turk (1689), the Darley Arabian (1705) and the Godolphin Arabian (1728). Their progeny were the first Thoroughbreds, per se, and although the foundation stallions had many off-spring, three of their descendants stand out as supreme: Herod, Eclipse and Matchem. In the lines of these horses were some outstanding Thoroughbreds: for instance, Princequillo and Round Table descend from Herod; Citation and Sir Ivor descend from Eclipse; and Man O' War from Matchem. The first Thoroughbred to arrive in America was a stallion named Bulle Rock, by the Darley Arabian. He was imported to Virginia in 1730 by Samuel Gist. 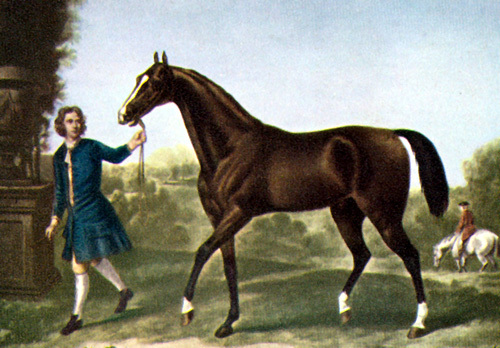 In 1757, Janus, a grandson of Godolphin Arabian, was imported and became the founder of the Quarter Horse breed. 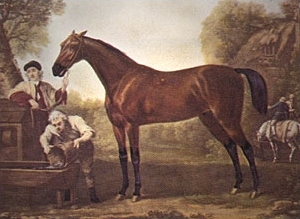 Diomed, who was imported in 1800 was the most important Thoroughbred imported to America in its early years. Lexington, by Boston, was foaled in 1850 and was the greatest sire of the 1800s. Synsonby – bred by Foxhall Keene, 1902, lost only two races in his career to Artful and Race King. Colin – unbeaten in his brief career in 1907 and 1908, won the English Epsom Derby in 1908. Exterminator – born in 1915, purchased in 1918 as a work horse for Sun Beau, the Derby favorite. When Sun Beau broke down before the race, Exterminator, raced at thirty to one odds, was the surprise winner. Man O' War – born in 1917, bought as a yearling by Samuel Riddle for $5,000, trained by Louis Feustel. His only loss was to Upset, as a two-year-old when he was Horse of the Year. Won 20 of 21 races. One of the greatest Thoroughbred sires of all times. Equipose – won the 1931 Preakness and the National Stallion Stakes at Belmont, known as the "Chocolate Soldier." In 1942, the year's leading sire posthumously, when his colt, Shut Out, won the Derby and was the top money winner. Citation – The first thoroughbred millionaire in history and a Triple Crown Winner. A versatile runner, by Bull Lea and born at Calumet Farm, Lexington, in 1945. He died there in 1970 at age 25, after a long and successful career as a sire. Tom Fool – born in 1949, purchased by Mrs. Harry Payne Whitney, Greentree Stable. Trained by John M. Gaver, second horse in history to win the Handicap Triple Crown. Horse of the Year and Handicap Horse of 1953. Native Dancer – this silver-gray horse won 21 of 22 races in his career. Owned by Alfred G. Vanderbilt, best two-year-old of 1952 and champion three-year-old in 1953, retired in 1954. Sired Raise A Native, Majestic Prince and Kauai King. Kelso – Horse of the Year 1960–1964. Won the Handicappers' Triple Crown in 1961 followed by nearly every important American Handicap Race. Owned by Mrs. Richard C. Dupont, trained by Carl Hanford. The gelding earned $1,977,896 after eight seasons of 39 wins in 63 races. Secretariat – in 1973, the first horse to win the Triple Crown since Citation in 1948, won 16 of 21 starts, fourth all-time money winner. Tied or broke five track records. Is considered the best racehorse of all time, having a heart weighing in at 22lbs. Thoroughbred Facts for Kids. Kiddle Encyclopedia.